It is no secret that we have a lot of books in our house. The truth is that we hardly buy the boys toys. 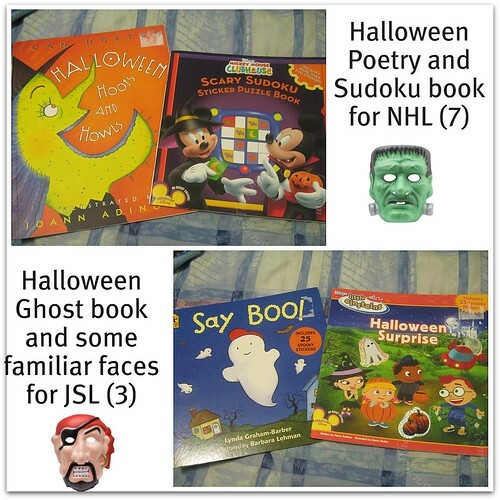 A lot of the time, TechyDad and I buy NHL and JSL books for a holiday gift. This includes Halloween and Thanksgiving in the Fall. On my frist outing while both boys were in school, I actually purchased a few books for the boys. Shhh….don’t tell them, but these are the new ones they will get on Halloween in lieu of candy and "stuff" that do not need. Of course, when the Scholastic Book order form came home with JSL, I was also tempted and bought two other books for the Fall. These are the two books that the boys have already received. I ordered these because I love books that are parodies of sorts to well known songs. The familiar sing-song repetiton with new words is great for kids of all ages (and adults too). JSL just started speech therapy and loves to sing. I am hoping that these will encourage him to work on articulation with a fun twist. We have several of the "There was an Old Lady…" books. We have a Halloween one, a winter one, and now the fall themed one. I love the drawings and how well you can sing along to the original favorite tune. NHL and JSL have read both of these books several times. I have also heard NHL going around the house spontaneously singing the songs. OK, OK….I admit it, I was also caught doing the same thing. I love being able to capture the holidays using new and exciting books with my children. Do you use books when celebrating the holidays with your children? If you do, please share any titles that you love, especially if they are for the autumn season. 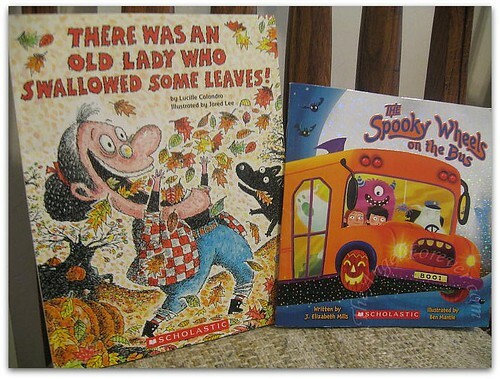 My friend, Debra (A Frugal Friend), recently wrote a post with her Favorite Fall Children’s Books. Please be sure to look at her fabulous list, and check out all of the suggestions in her comments as well. I have already gotten a few of them for my boys to read. Disclosure: All of the books pictured were purchased with my own hard earned moolah.